Good decision. Much as I quite enjoying towing, after a morning of winding through relatively minor roads dotted with villages and speed limits, I was beginning to feel like a rest. Fortunately we arrived at Bellebouche at about 12:10 PM, just before the accueil [reception] closed at 12:30 PM for lunch. We pitched up and settled down to lunch ourselves before heading off to search a couple of small fishing lakes on site to see what we could find. Quite soon into our wander, somebody settled in the tall grass beside me. In my haste I fluffed my first attempt at a shot but got a second before it disappeared, never to be seen again. I realized it was an Emerald (Lestes) of one sort or another but it didn’t look quite like those I’ve seen before. 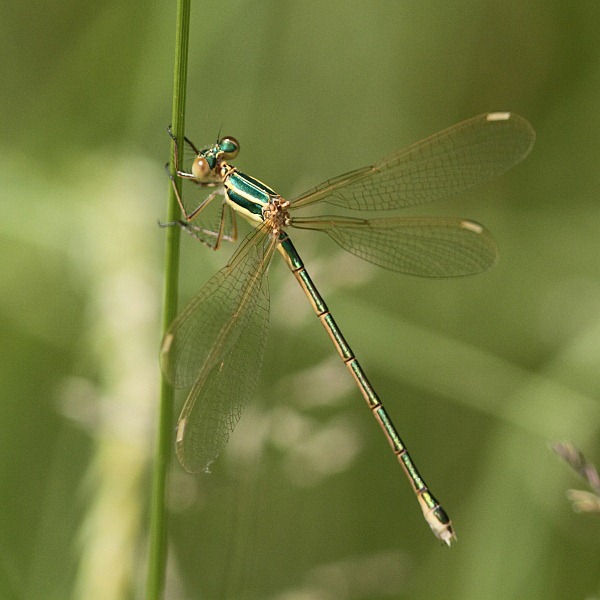 I’ll have to get my suspicions confirmed but I’m pretty sure this character is a female Southern Emerald Damselfly (Lestes barbarus), a new Odo for our catalogue. The weather forecast proved to be accurate; what started out as a walk in the sun became a walk under threatening clouds. Francine certainly thought her washing was under threat and returned to rescue it, just in case, leaving me to continue unaccompanied. Some female dragonflies seem to me to prove elusive. Whereas males tend to defend their claim to a territory and be relatively easy to find, the females of the species seem to hide elsewhere until they are ready to mate (or, as Francine would have it, until they fancy a shag). One species like this is the Scarce Chaser (Libellula fulva), of which I’ve seen countless males but as yet not a single female. Another of my female bêtes noires has been the White-tailed Skimmer. As the sky continued to darken I very nearly didn’t bother searching the far end of the second small lake but I’m delighted I persevered. 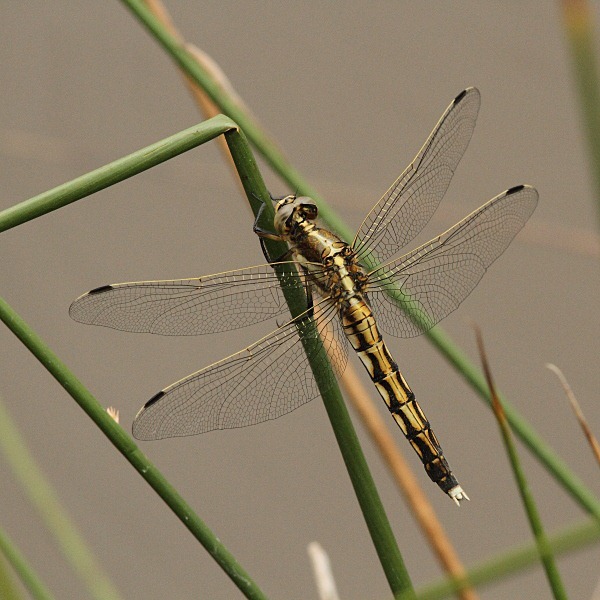 On my way back there she was, low down in some grass stems beside the lake, my first female White-tailed Skimmer (Orthetrum albistylum). Isn’t she lovely?